Our RFID blocking money clip with ID features six credit card slots, and ID window, and a single spring action clip. This slim leather wallet with money clip has three card slots on each side of the interior that are protected from electronic pickpocketing. 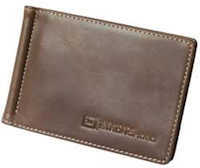 The netted ID window and contrasting top-stitching give your money clip a distinctively rugged look. Perfect for a front shirt or pants pocket. This small RFID money clip card holder is the perfect answer to protect your credit/ID cards. 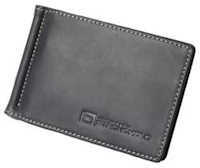 This RFID blocking leather money clip has a Secure by Design Police Approval Specification for Identity Fraud Protection.